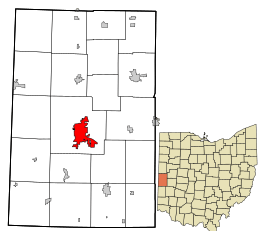 Location in Darke County and the state of Ohio. Greenville is the historic location of Fort Greeneville, which was built in 1793 by General Anthony Wayne's soldiers during the Northwest Indian War. Named for Revolutionary War hero Nathaniel Greene, its defenses covered about 55 acres (220,000 m2), which made it the largest wooden fort in North America. Two years later, the Treaty of Greenville was signed at the fort on August 3, 1795, bringing an end to the Indian wars in the area and opening the Northwest Territory for settlement. Fort Greenville was abandoned in 1796, and the town Greenville soon grew up on the site. Greenville is located at (40.102474, -84.627985). According to the United States Census Bureau, the city has a total area of 6.66 square miles (17.25 km2), of which 6.60 square miles (17.09 km2) is land and 0.06 square miles (0.16 km2) is water. Greenville is home to The Great Darke County Fair which runs for nine days in August. Greenville is also home to KitchenAid small appliances. Built in 1849, the historic Bear's Mill, is an authentic example of a stonegrinding flour mill of its time. Placed on the National Register of Historic Places in 1977, it is still in use today to grind cornmeal, whole wheat flour, rye flour, and pancake mixes. The mill and the buhr stones are powered by water. Self-guided tours may be taken during normal business hours. Greenville has a local history museum, the Garst Museum, which features the largest known collections of memorabilia of Annie Oakley and Lowell Thomas, both of whom were born nearby. It also holds historic artifacts relating to Anthony Wayne and the Treaty of Greenville as well as Native American artifacts. The museum also includes a village of shops; a wing of early American furnishings, pioneer life, and military uniforms; an early Indianapolis 500 race car built in Greenville; and an extensive genealogy room for research. Also located in Greenville is St. Clair Memorial Hall, the center for the arts in Darke County. This piece of architecture, built in 1910, has been completely remodeled and is a showpiece for all of Darke County. The city and surrounding areas are served by a daily newspaper published in Greenville, The Daily Advocate. Various companies and brands such as KitchenAid, FRAM Group, and BASF North America have offices in Greenville. As of the census of 2010, there were 13,227 people, 5,933 households, and 3,430 families residing in the city. The population density was 2,004.1 inhabitants per square mile (773.8/km2). There were 6,536 housing units at an average density of 990.3 per square mile (382.4/km2). The racial makeup of the city was 96.7% White, 0.9% African American, 0.2% Native American, 0.7% Asian, 0.3% from other races, and 1.1% from two or more races. Hispanic or Latino of any race were 1.4% of the population. There were 5,933 households of which 26.3% had children under the age of 18 living with them, 41.2% were married couples living together, 12.0% had a female householder with no husband present, 4.7% had a male householder with no wife present, and 42.2% were non-families. 37.5% of all households were made up of individuals and 19.4% had someone living alone who was 65 years of age or older. The average household size was 2.17 and the average family size was 2.83. The median age in the city was 43.4 years. 21.5% of residents were under the age of 18; 8.4% were between the ages of 18 and 24; 21.8% were from 25 to 44; 25.6% were from 45 to 64; and 22.5% were 65 years of age or older. The gender makeup of the city was 46.0% male and 54.0% female. As of the census of 2000, there were 13,294 people, 5,649 households, and 3,462 families residing in the city. The population density was 2,206.4 people per square mile (851.2/km²). There were 6,030 housing units at an average density of 1,000.8 per square mile (386.1/km²). The racial makeup of the city was 97.31% White, 0.56% African American, 0.17% Native American, 0.53% Asian, 0.02% Pacific Islander, 0.44% from other races, and 0.97% from two or more races. Hispanic or Latino of any race were 1.14% of the population. There were 5,649 households out of which 27.3% had children living with them, 46.5% were married couples living together, 11.0% had a female householder with no husband present, and 38.7% were non-families. 34.4% of all households were made up of individuals and 16.9% had someone living alone who was 65 years of age or older. The average household size was 2.23 and the average family size was 2.85. In the city, the population was spread out with 22.7% under the age of 18, 8.3% from 18 to 24, 25.4% from 25 to 44, 20.9% from 45 to 64, and 22.7% who were 65 years of age or older. The median age was 40 years. For every 100 females there were 84.1 males. For every 100 females age 18 and over, there were 78.6 males. The median income for a household in the city was $31,791, and the median income for a family was $38,699. Males had a median income of $33,143 versus $24,875 for females. The per capita income for the city was $18,830. About 10.2% of families and 13.4% of the population were below the poverty line, including 18.8% of those under age 18 and 14.6% of those age 65 or over. 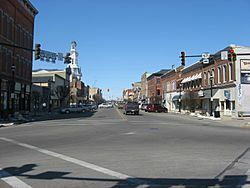 Greenville, Ohio Facts for Kids. Kiddle Encyclopedia.